Jacky's microscopy | My experiments with microscope and microtome, and my photomicrographs; now extended to field notes of forays too. PMS 15 – or more interesting slides – a Mixed bag. In the Amateur Microscopy Facebook group Wojtek Plonka posted about an LED gizmo he had constructed that used programmable LEDs. You can program it to work from a Arduino as a ‘stand-alone’ device that you can switch between modes (of your own devising). He was using a NeoPixel 7 Jewel with an Arduino to mimic Rheinberg illumination. I always struggle to get Rheinberg filters to work for me – just don’t get the central spot in the right place. This gizmo seemed to be quite flexible so we (me and E) made one up. I’m still having an issue with positioning under the stage so I looked at the videos of Kevin Webb’s talks in 2015 – both at Northampton Natural History Society’s Microscopy exhibition and at Quekex 2015. His trick is to use an inverted microscope so there’s plenty of space for organising the light source. However with similar LED light rings he produced some amazing images, ones with detail that surpasses those you can get with conventional illumination. This is something with potential and is worth spending some time on. I have also played with colour configurations and intensities – I need low intensity to be able to see what I’m looking at, and high intensity for photography, especially if I introduce polarising filters or dark ground, which attenuate the light strength. By using a potentiometer in the circuit I can control the intensity. A Seabuckthorne scutiform scale illuminated by half red, half green and a null centre LED. This does not achieve Rhenberg, but the refraction of the coloured light does show up some of the details. The same set-up all I did was to press a button on the Arduino controller to switch to a Yellow ring with a blue centre – classic Rheinberg configuration. This, on the other hand is how it looked with all white LEDs and a diffuser to help suppress fringing. Which is, in my opinion, a much nicer image, much clearer. 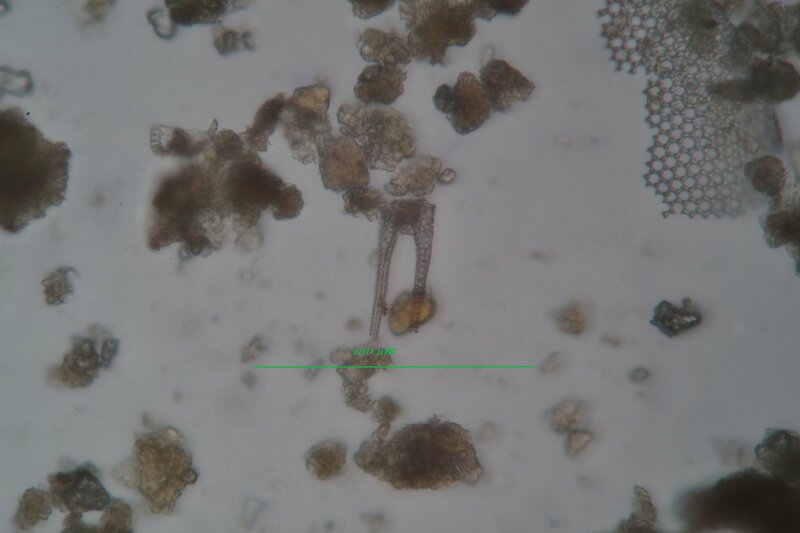 I’m fiddling with this system to try to help with the refining of the Oamaru diatoms. They do stand out with the LED lighting, and every little helps. The sides are wrapped with reflecive silver paper (Kitchen foil) and this should give a dark ground surface on which to put the picking tray. The whole thing – wrapped in black duct tape sits under a dissection microscope and the LED is placed under the lower dish. It works quite well and cost me nothing as I already had all the parts. I do like Heath-Robinson constructions – in making them you end up having to understand what you have done. I’ve now got some diatom picking skills and tools. They’re not perfect but do work much of the time. I have a problem which is that having found a nice specimen and picked it what next? 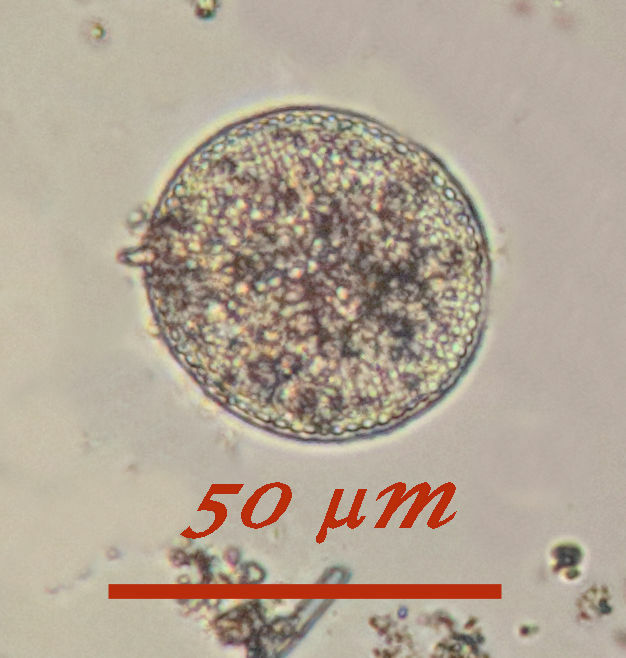 Initially I put them onto a clean slide – a tip from the microbe hunter forum is to mark the receiving slide, on the obverse, with rings. This is a good idea because it helps locate the pickings when done. 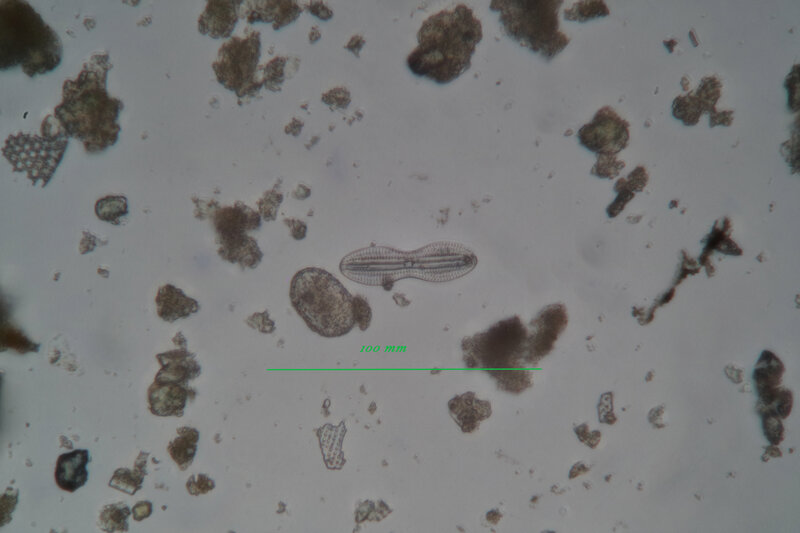 But the slide is clean and dry, as are the diatoms. 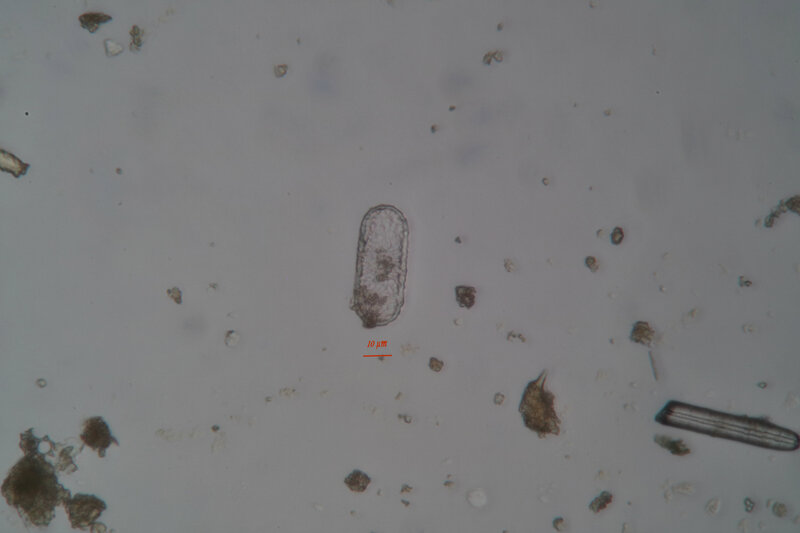 I have tried going straight to Plurax after heating the slide etc to get the diatoms to stick. But there are at least two reasons not to to this. The less urgent one, but the one that bugs me most is that, generally, I can achieve only ONE good specimen per slide. The more urgent one is that I need to improve my Plurax fixation and control the temperature much more than I have. It has been a bit hit and miss so I get VERY uneven distribution of the mountant and BIG holes in it. I can cure that one with practise and diligence. I am waiting for the ingredients for an adhesive to arrive and that should help me get a better outcome too – more about that later. So what is the ‘frustration’ – it’s finding nice specimens, photographing them and then not being able to make good permanent mounts, and probably losing them on the way to such. Yesterday, in a dried strew of the acid washed residue, I came across this one. 2. I won’t break it. THAT is frustrating. But at least I have a picture of it. I also console myself that my sampling is of a minute fraction of the material I have. If I can find one of anything in the sample there must be a great deal of them in the bulk material. i.e. thay can’t be THAT rare. So if I lose one I’ll probably find another as I work through it. I’d better get on with improving my techniqus. From what I can see I think it is probably a Stictodiscus novaezealandiae Grunow, A in Schmidt, A 1888 – same source. It looks pretty much entire and if I add some distilled water to the right pick I might be able to float it free of the brash. Note all the conditional words there. But today, while waiting for the delivery of materials, I think I’ll start afresh with a good boil in HCl of a new dollop of the mud. Wish me luck. Trigonium articum Cleve, P. T. 1868. I have been experimenting with picking off individual diatoms. I tried an acupuncture needle attached to part of a mechanical stage – not very effective. Next a 1ml pasteur disposable pipette – this one had a very small hole and worked quite well The new 1 ml ones are coarser – not so good. My best shot so far is a glass micropipette stuffed into the coarser 1ml Pasteur. I’ve always enjoyed working with glass, but you do need it to be soda glass in the domestic environment. I got myself some melting point tubes, pulled them out over a tea light and gently snapped them, wrapped in tissue, between my thumb nails. They’re surprisingly effective, with reasonable shaped ends. 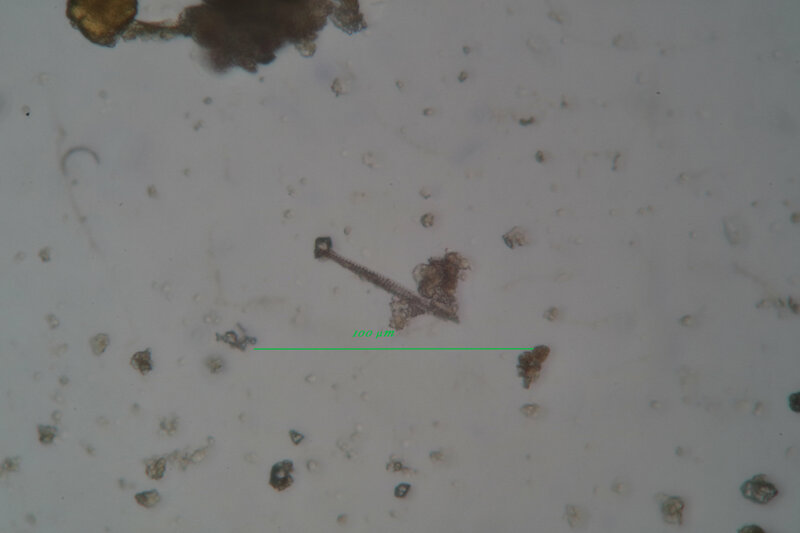 Then under the stereo microscope on the lowest magnification, but with the x2 Barlow lens in place. I used this to pick off individual diatoms onto prepared coverslips. The diatom suspension (from the filtration experiments – both 250 mu and 75 mu residues separately) was in a 55mm Petridish illuminated by two ‘angel-eyes’ LED rings strapped together to provide a low cost lateral illumination that worked extremely well – but did get hot. 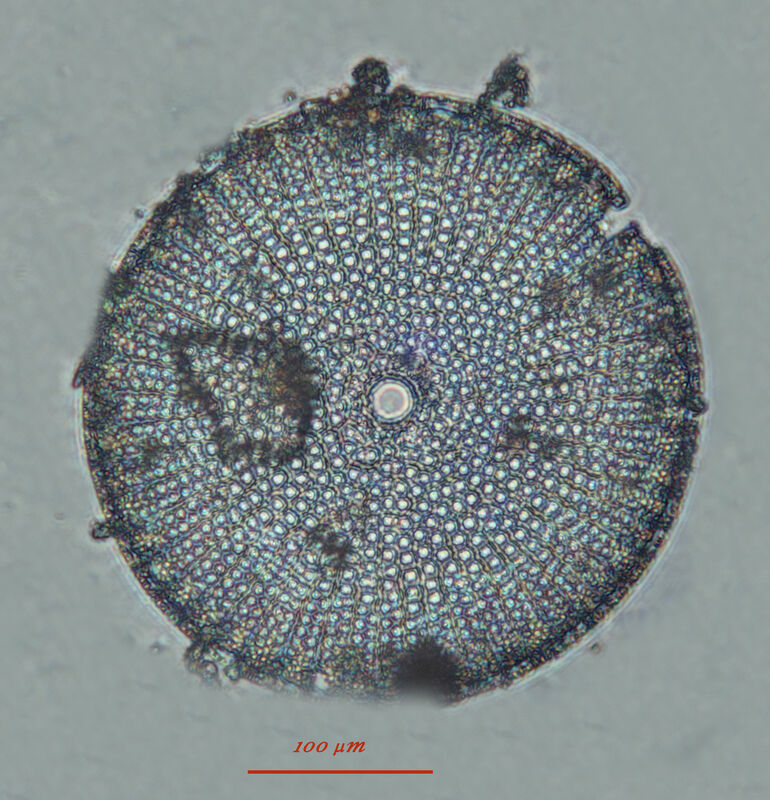 This had the effect of contrasting the diatoms against the dark backround – making them easier to see. 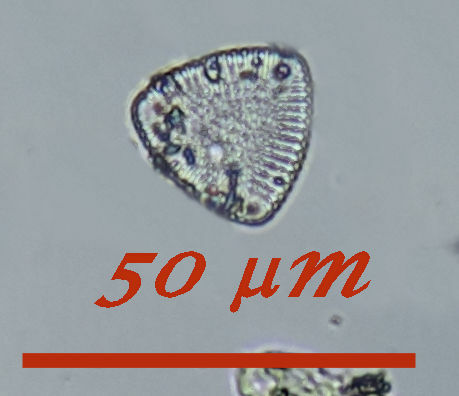 The picked diatoms were examined under a magnification of 400 to check their suitability and the selected ones mounted in Pleurax. And I have refined quite a few techniques. 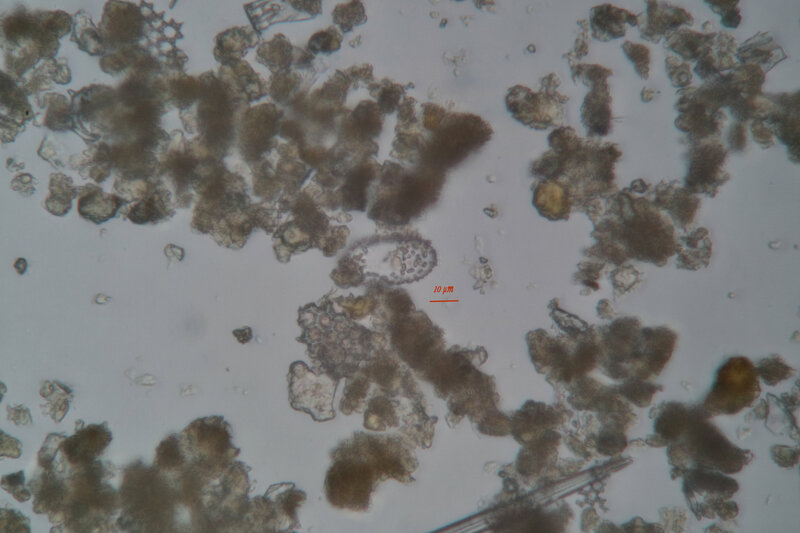 So I had some sediment derived from the Oamaru Cormacks diatomite. Cleaned up as described below, but still a little grubby. 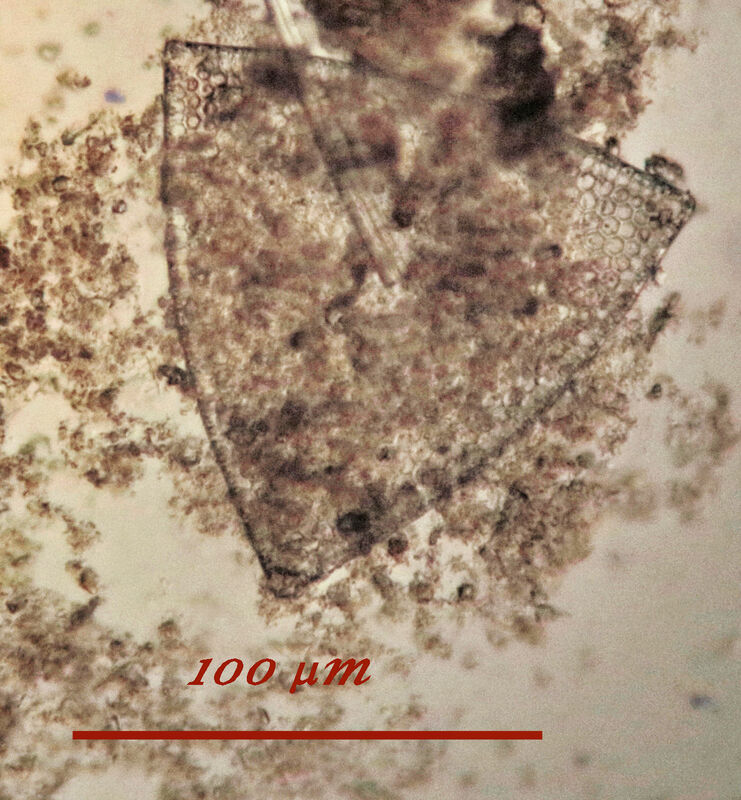 It consisted of siliceous fragments and diatoms. 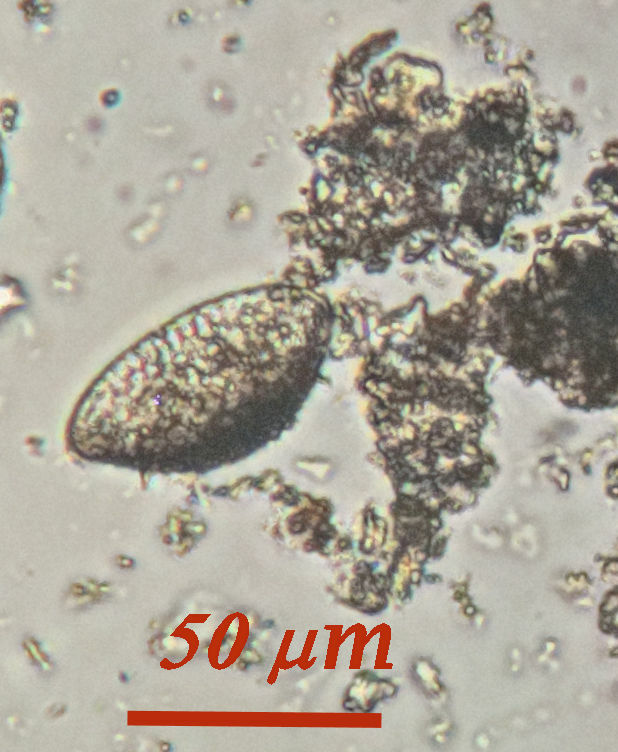 The challenge to get out intact, or nearly intact, diatom frustules from brash was to separate objects of the same size made of the same material without damaging them. Place a suspension of the material in a liquid on a vibrating surface (in this case a Boston Acoustics Woofer loudspeaker laid horizontally). Subject it to vibration at between 15 and 45 Hz for a period of time. (without damaging the loudspeaker). I tried this using an online tone generator , 50mm glass Petrie dish and distilled water. I made a dH2O suspension of one drop of the sediment to give me a slightly cloudy mixture. Aliquots were then subect to a range of vibration and time. Samples taken from the centre, one third radius and two thirds radius where popped onto slides and examined, first wet at x10, then when air dry at x40. The ratio of desired object to brash was really low, more so than in the untreated material. I am currently making some measurements across the range to confirm my first impressions but would infer that the vibration gave me more brash – so probably fragmented a lot of the material further. 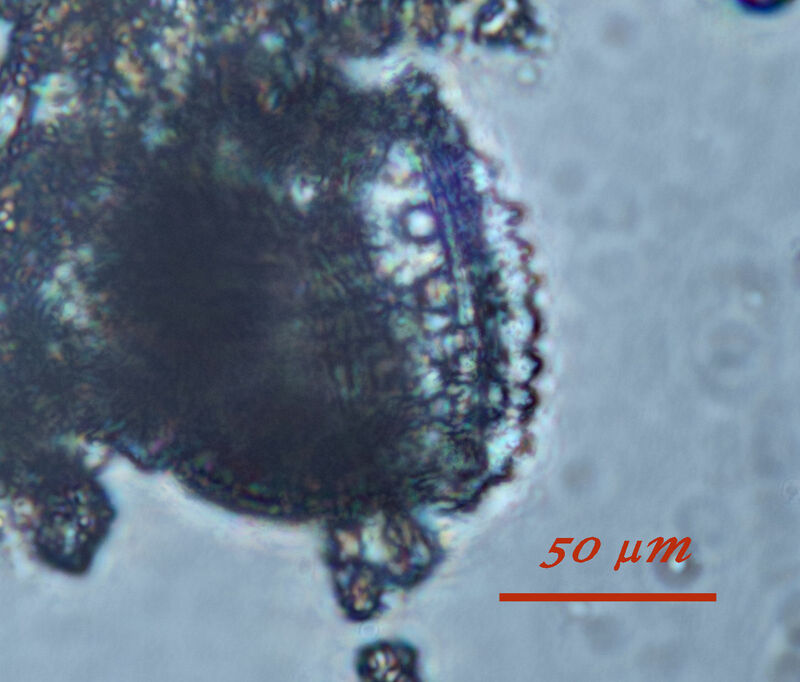 On consideration vibration is used to disrupt particles, and although this method may work well with living diatoms that are proected by the cell contents, these fossil ones are actually rather brittle. Another consideration is that the sound waves are propagated on an up-and-down axis. the ripples in the suspension will also be up-and-down, so why would this method segregate the particles? 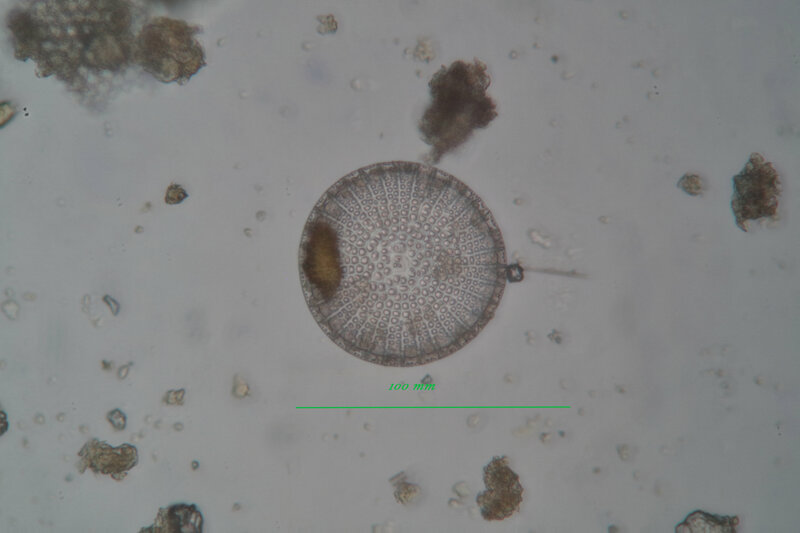 However, as I said, the method apparently works with living diatoms. Obviously there is more physics to be explored in this system. I will probably not follow it through, my life is limited and I really wouldn’t have the time for this game. Below are pictures of the only decent objects from this experiment at 26Hz for 3 minutes. They were mostly rubbish but one or two delights made it through the process. At 15Hz for 10 minutes there were no usable objects. A friend alerted me to a set of micron filters available from a Marine Aquarist at relatively reasonable cost. So I got some- ostensibly 250, 125, 75, 50, 25, 10 and 5 microns – and passed some of the diluted suspension through the series. The greatest residues. by a long way, were in the 125 and 10 micron filter. The final filtrate still showed some signs of milky white particles, microscopically they are not interesting in this context. The experimentation is in its early days, but the fraction retained by the 125 micron filter has yielded a greater density of desired size objects, less brash than any of the vibration fractions. Identifcation where attempted is provisional and made using Nigel Charles’ excellent site. 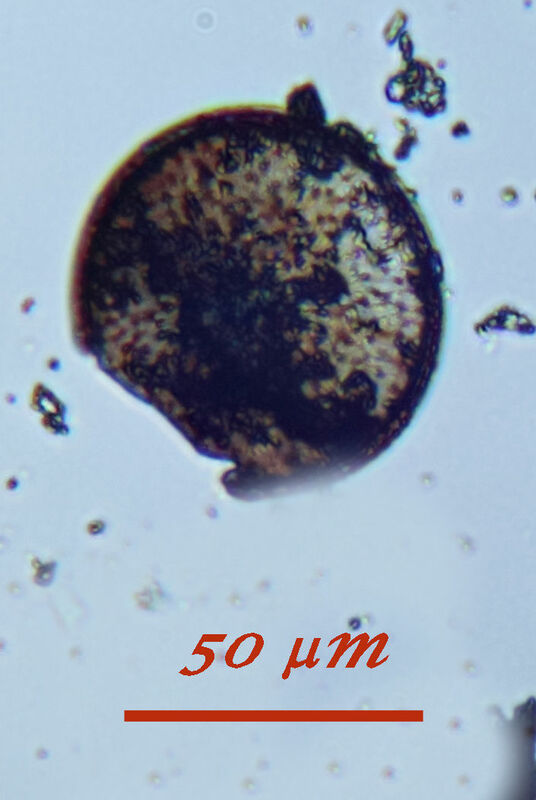 Finally I put a 50mm Petrie disc under the x16 objective and had some really good fun shaking it gently. It really does bear an uncanny resemblance to the O2 Dome. These remind me of an mummified body. What is most satisfying is the variety of objects I am seeing, and from minute drops of the suspension. 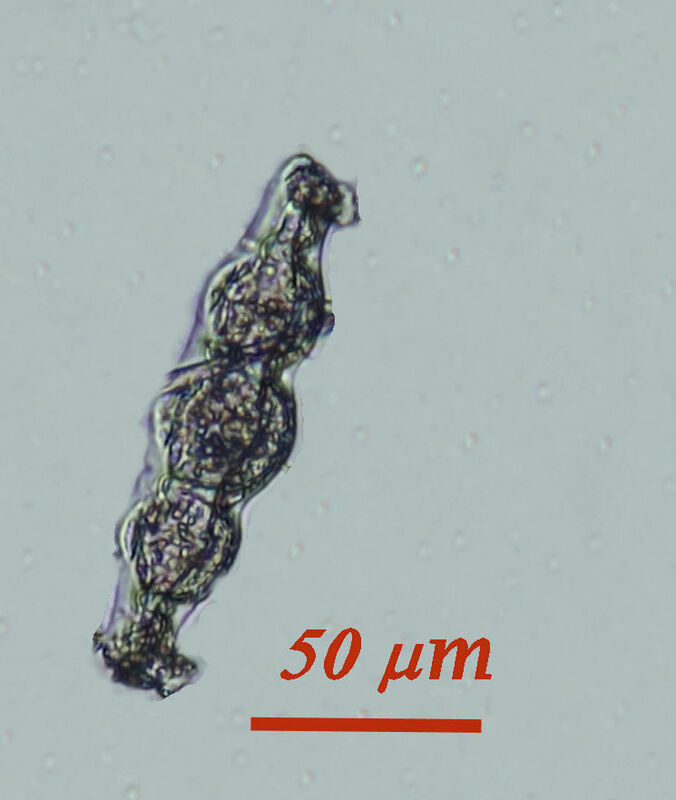 I haven’t included the weird and wonderful spicules that are also there, maybe that will be in a different post. Cleaning up then – Next! which involves some nasty chemicals. Hence the need for clear weather and a ventilated cabinet. At the Reading Convention I bought a hand centrifuge from the sale of member’s effects and it has been most helpful in speeding up the separation of residues from liquids. I must have spent several hours winding the handle on that day – all good exercise. The aliquot that was most ready for taking through this process was, unfortunately, one I had boile dry-just- in a previous cleaning. 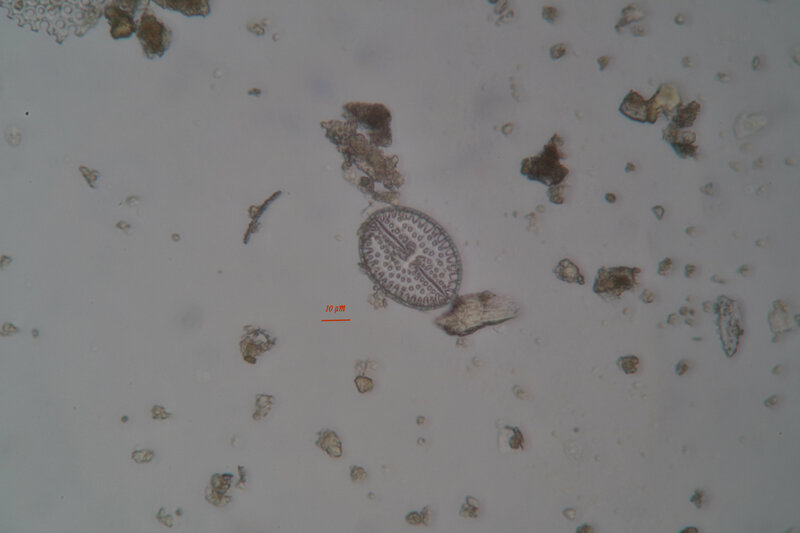 I had checked and the diatoms were still there it was the mud that had burned. However I considered it worth carrying on as this is probably just a ‘first pass’ experiment to reveal the issues that might be involved. It worked really well. The only downside is that as the sample started out charcoal colored rather than creamy white, the final outcome is rusty coloured – obviously it needs some extra treatment to remove the residue from the burn. Every time I have separated residue from supernatant I have check a sample or two of the supernatant for the inadvertent presence of diatoms. With the second aliquot somewhat behind the first in treatment but not tainted by burnt material, these liquids have tended to be opalescent, even after 20 minutes of centrifuging at one cycle per minute and a half – the fastest I can sustain for any period. 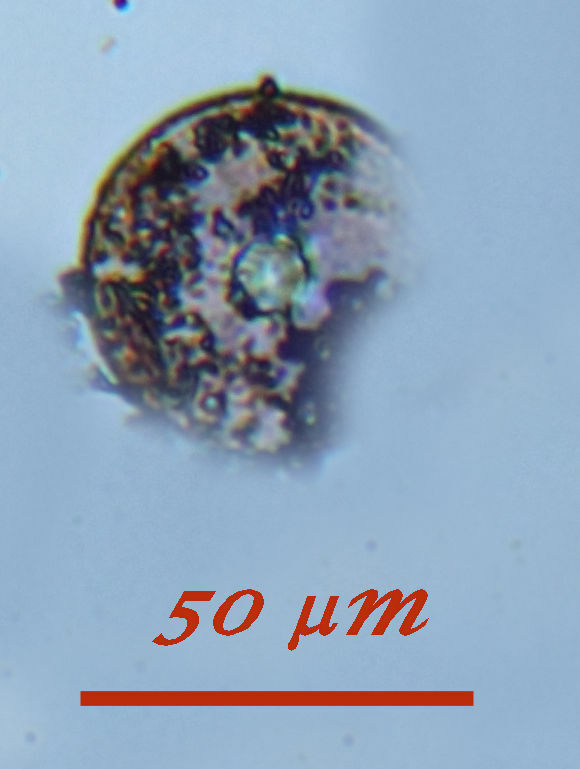 Consider the likelihood of an intact diatom being present in any of the samples I have looked at. the starting material was the supernatant formed when 1 kg of the rock was freeze-thawed in distilled water (approximately an equal volume of water), Each aliquot I have was taken after partial breaking up and was about 150ml. After taking the sample it was diluted with distilled water and boiled with soap, then passed through a cycle (something like four times) of settling, decanting the supernatant and redilution to remove the mud released. The resulting solid fraction was then heated with an equal volume of the acid and treated as above, This was done for three different acid mixtures. 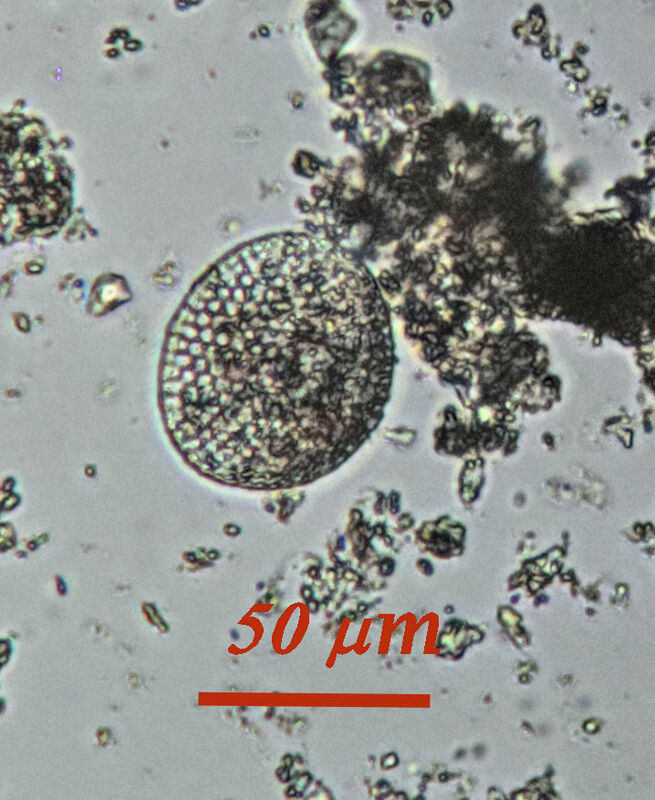 The principle is that the diatoms are made of a glass like material and are heavier than mud and other contaminants. They are acid resistant – because they are glassy. They should settle into the solid fraction. 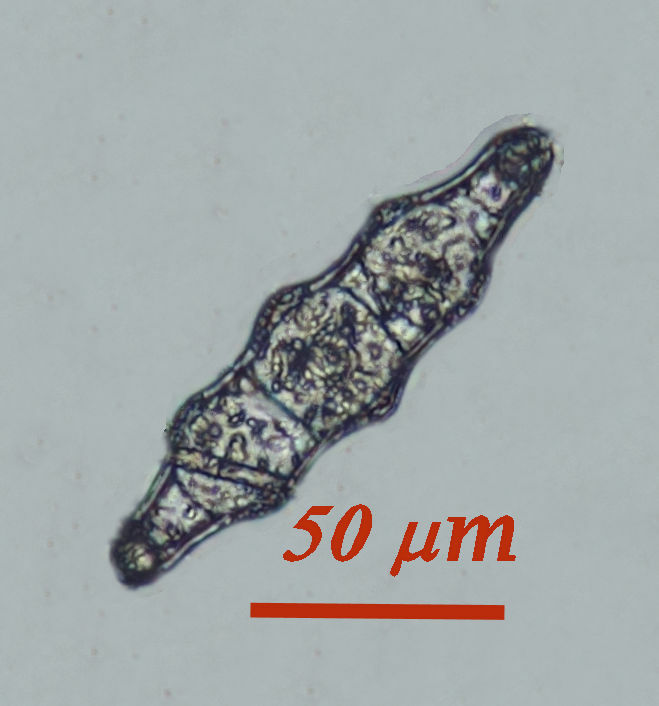 However some of the diatoms are very small in which case other factors come into play. I am not sure of the physics but slight surface contamination might lead to flotation due to a charged surface, or something like that. This means that some – probably the smallest ones may well remain insuspension and so be found in the various supernatant fractions. This is where the centrifuge would help as it works mainly on density (I think). Also every time material is processed, even with a lot of care, some will be lost. I have found that my early training in quantitative analytical biochemistry helped me to retain a lot of it, but there will always be losses. All of these factors are ones that could result in me losing diatomaceous material from the solid fraction. The samples I have examined microscopically are taken as one drop from the material, spread on a slide. I get about 25 drops to one ml. When I have used a heavy deposit I have diluted the material in the ratio of one drop to about 2ml and taken 1 drop of that onto the slide – about a 50 times dilution. 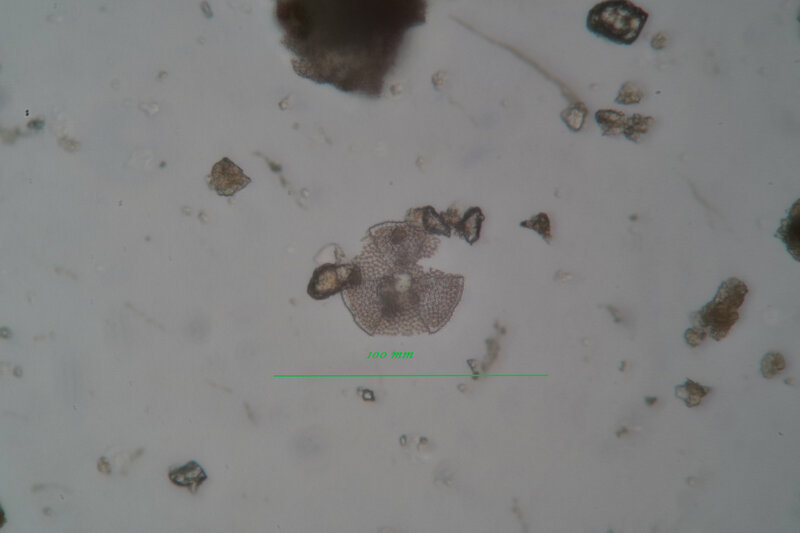 If I find any diatoms in a sample with that degree of attenuation there must be loads in the original material – see how I use exact scientific terminolgy 🙂 . 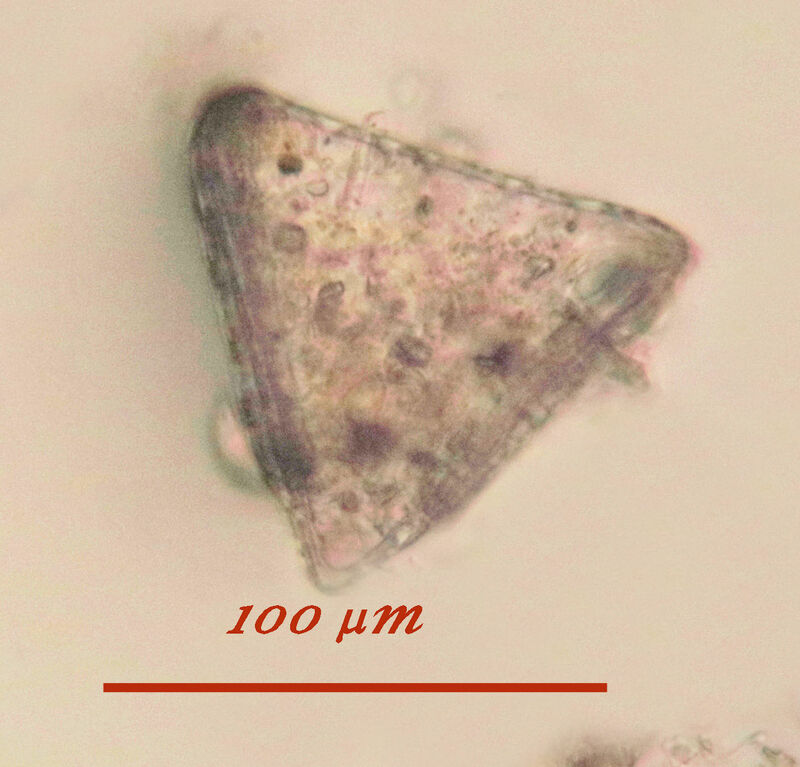 When I look at the supernatant specimens and they have a very low count of diatoms I feel justified, in this instance, of considering those an acceptable loss. So I will not pursue those. 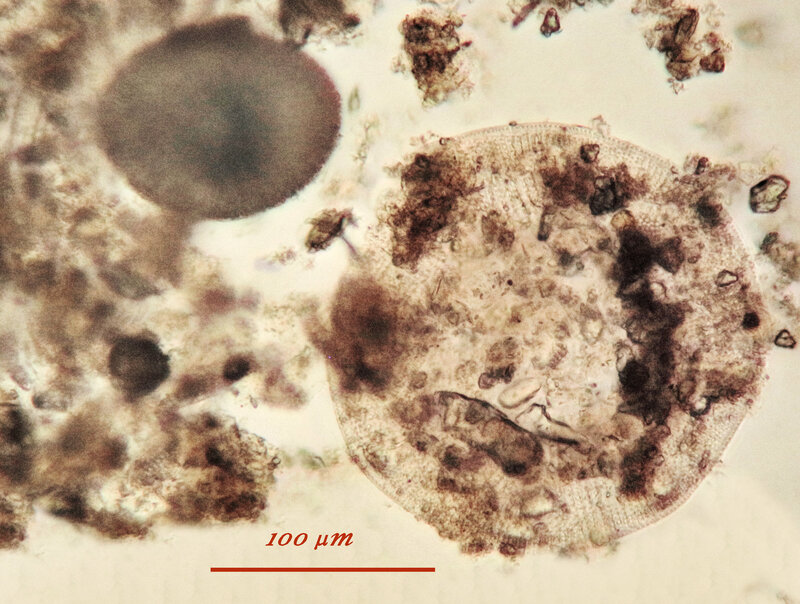 The sediment seems to be composed of a lot of broken material, however it has been around for 35,000,000 years or so so that is not unexpected. In fact it’s a bit of a miracle if anything survives intact. 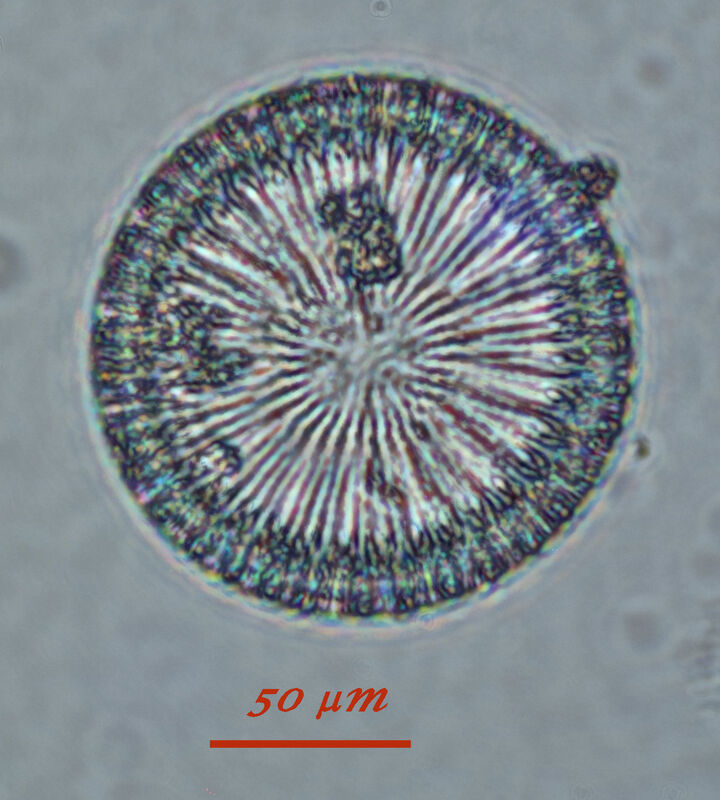 This is typical with needlelike things – spicules not diatoms – but among the detritus there is one circular diatom with an ornate border, one apparently empty ring and a rectangular oval with a dark area in the centre. 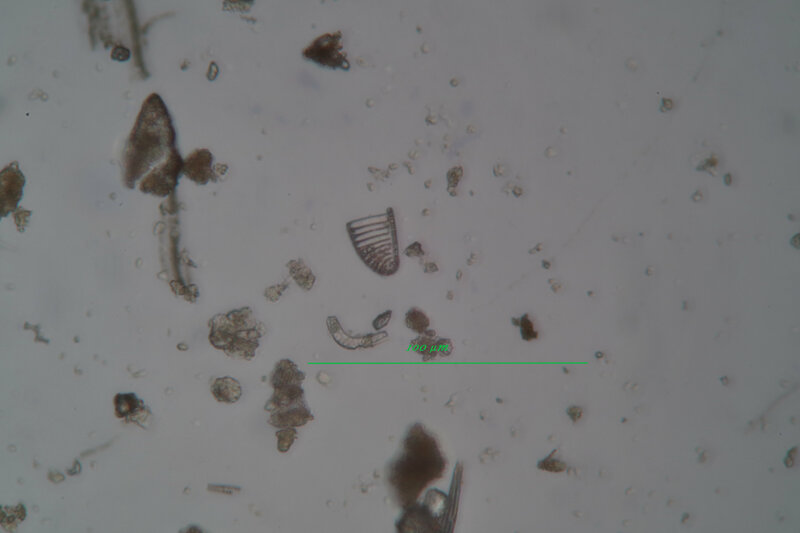 All of these are diatoms from Oamaru but pinning down their exact name is a bit more difficult. So they must be realtively common in the sample. – remember this is one drop from a massive dilution of a bit of mud washed of the surface of a rock 35m years old. 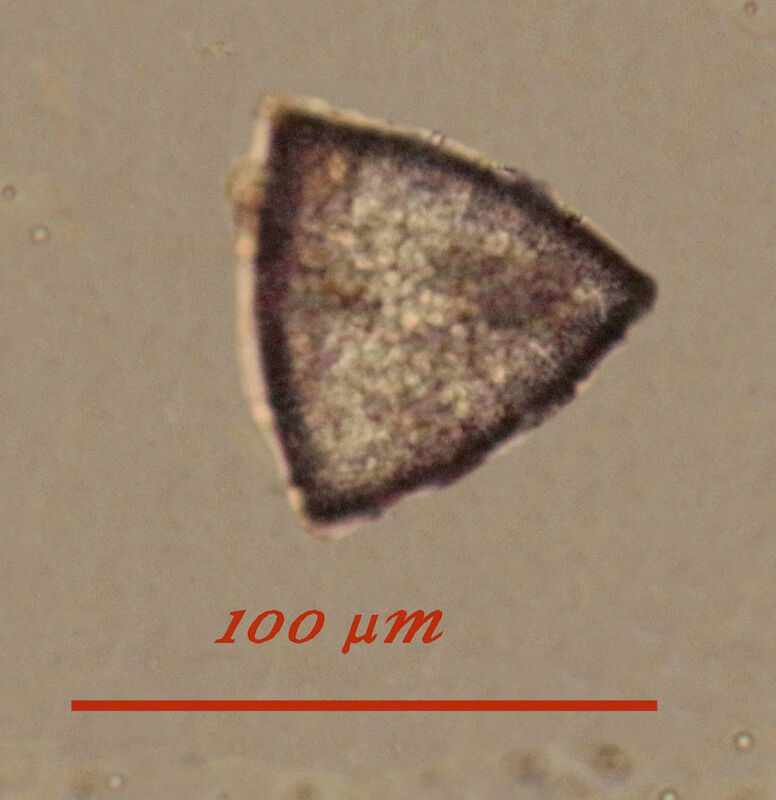 this triangular fragment might be a Triceratium – for example T. castellatum West var. castellatum. 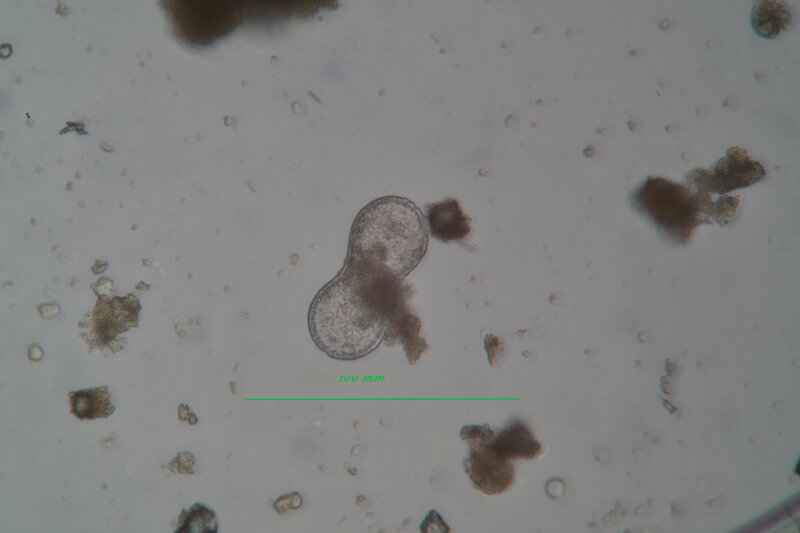 And these are ubiquitous – I’ve found them in every sample I’ve looked at. 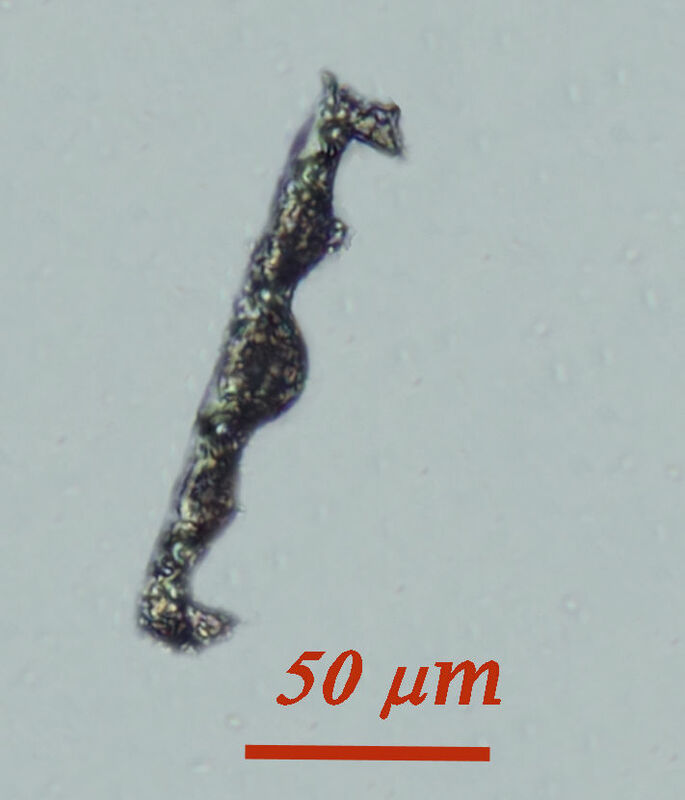 Although I’m ignoring the spicules they are not without interest. Here are a couple, they’re very three dimensional and this was taken from a wet mount so it was rather difficult to get a good clear image for stacking. 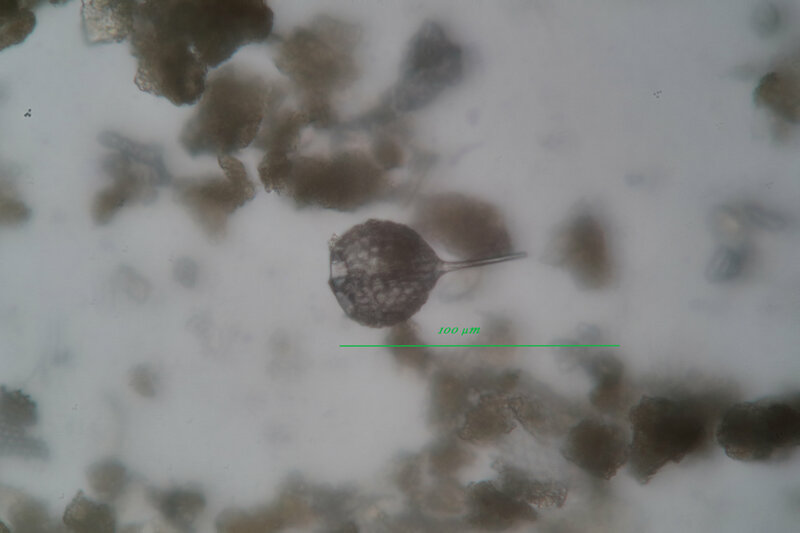 The first one has a clear spike at right angles to the cross, the second is a VERY spiky object and the third is probably not a spicule, but it is an interesting shape and I have no idea what it might be. I need now to separate the whole elements from the detritus. For this I plan to try a method I saw demonstrated at the Reading Convention in 2016 – Tony Pattinson had a tone generator and a loudspeaker. I have my lovely husband currently considering where we shall get the appropriate parts from, confounded a little by the liquidation of Maplin. Still working on the Pleurax mounts of partially cleaned Oamaru diatomite. This is very addictive, a single slide just keeps giving, and I stil have to get rid of additonal rubbish. 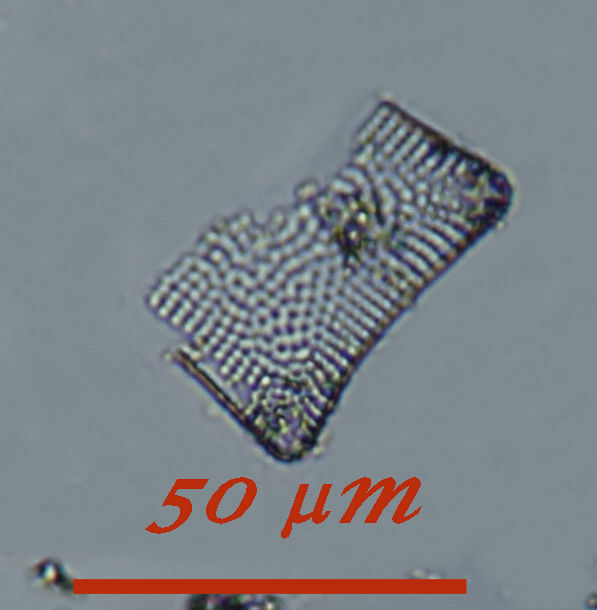 But today’s crop is herewith, again the file names give a clue to what I think they are, courtesy again of Oamaru Diatoms.. 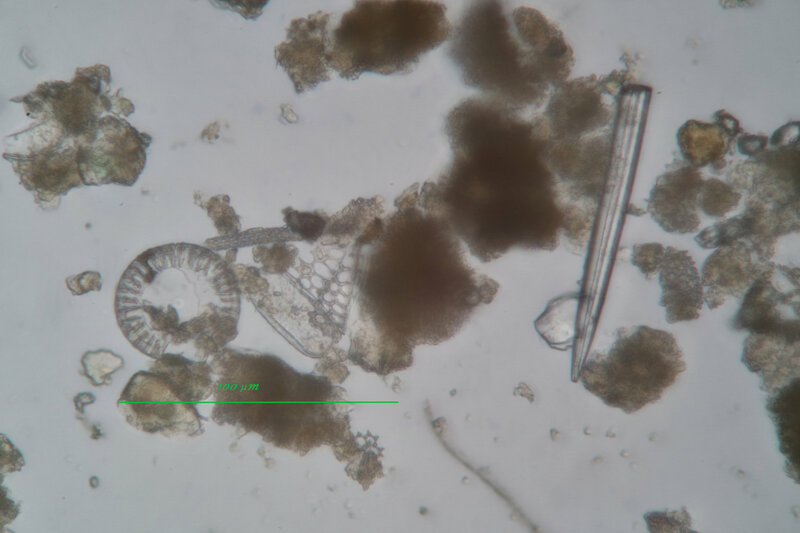 I contacted oamaru diatoms about one of the images and was saddened to hear that Nigel Charles passed away in January and the site is being maintained but not extended by a friend. It is such a useful site and he must have put hours of work into it, Thank you Nigel and thank you friend for keeping it going. I am also getting better at cleaning up the images. SeedsAside Botany, Photography, Franco/English rather interesting .